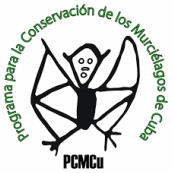 ﻿ There are currently 26 species of bats in Cuba spread across 6 different families. Considering the large number of caves in Cuba, it is no surprise that 16 of those species exploit this habitat. (Click on the family names for further information). ﻿﻿The name of this family of bats is derived from the lance-shaped nose that it uses for echolocation. The diets of these bats (depending on the species) range from fruit, nectar, pollen, insects, small vertebrates, and even blood! The fruit and nectar bats play an important role in the pollination and seed dispersal of tropical plants. ﻿These are small insectivorous bats which are part of the largest bat family in the world. They roost anywhere from man-made structures, foliage, caves, and trees. In temperate environments the species in this group tend to hibernate, while in the tropics they go through periods of torpor. This group of bats gets their name from their large funnel-like ears. They are tiny insectivores with large appetites, and can in an hour consume their body’s weight in mosquitoes. They live in caves, and have been found as deep as several kilometres from the cave’s entrance. These bats are identified by their large lips, and a leaf-like projection off their chin instead of their nose (as in the Phyllostomidae). They are insectivorous cave dwellers, inhabiting large colonies that can range from several hundred to several thousand individuals. The large production of guano (bat poop!) allows for commercial mining. This family of bats are known for the long tail that protrudes past the tail membrane. They are aerial insectivores and primarily consume moths, large beetles, and flies. They have adapted to the city environment, and have been known to roost in tile roofs which can lead to bat human conflicts. ﻿﻿﻿This is a large species which feeds primarily on fish, but will eat insects as well. It uses its large rake-like feet to skim the top of the water and scoop up tiny fish from the surface. Compared to other species, their wings are fairly sticky and oily which helps in making them waterproof. They are often recognized by their distinct fishy/ musky odour! They inhabit sea caves, and tree trunks.